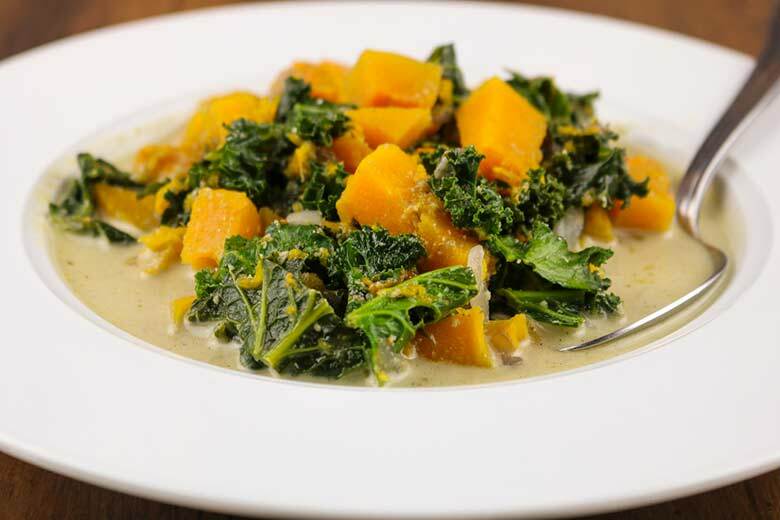 Heat 2 tablespoons of coconut oil over medium heat in a large pan, add the squash and stir cook stirring occasionally until lightly browned 5 – 7 minutes set aside in a bowl. Add 2 tablespoons of coconut oil back to your large pan, medium heat add onions and 2 teaspoons of salt and cook until softened for about 5 minutes. Stir in curry paste, garlic, and ginger and cook about 30 seconds. Stir in the water and coconut and bring to a simmer, cook until the coconut is softened about 5 minutes. Using a blender process the coconut mixture until it’s finely ground up for about 2 minutes you might have to do this a couple of times. Strain the mixture through a cheese cloth squeezing as much as the liquid you can, discard the pulp. Take out 1/2 cup and set aside. Stirring in the bell pepper cover and cook till done about 10 minutes. With the reserved coconut broth and arrowroot flour stir in vegtables and cook until the sauce thickens slightly for about 2 minutes. Stir in the lime juice and scallions and season with salt and pepper. If you want use extra lime to juice to taste.